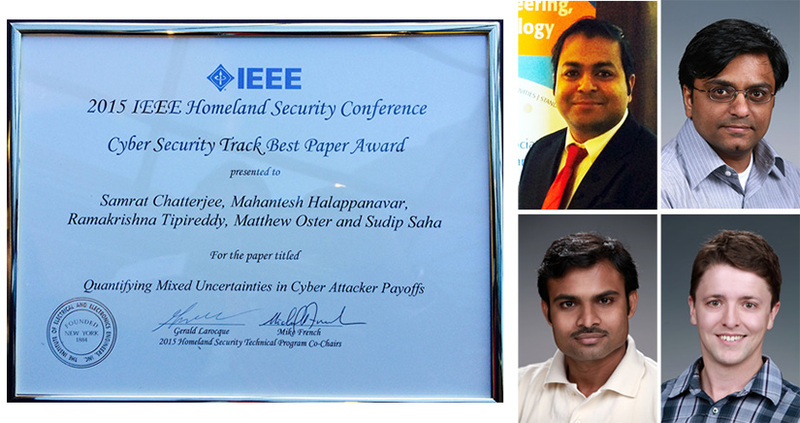 As part of this year’s IEEE Symposium on Technologies for Homeland Security (HST ’15), the leading science and technology symposium devoted to homeland security, scientists from PNNL and Virginia Tech were honored with the Cyber Security Track Best Paper Award for their work, “Quantifying Mixed Uncertainties in Cyber Attacker Payoffs.” The paper employs game theory to mathematically address cyber-system security and resilience challenges in the context of added uncertainties. The authors received their award during the initial HST ’15 Plenary Session on April 14, 2015. PNNL authors Chatterjee, Halappanavar, Oster, and Tipireddy (clockwise top left) with their award from IEEE HST. Enlarge Image. The team from PNNL’s National Security and Fundamental & Computational Sciences directorates who collaborated on the award-winning paper included: Samrat Chatterjee (NSD’s Operations Research Team), Mahantesh Halappanavar (Data Sciences, ACMD Division), Ramakrishna Tipireddy (Computational Mathematics, ACMD Division), and Matthew Oster (NSD’s Operations Research Team). Sudip Saha, from Virginia Tech, also was a contributor. The work was supported by PNNL’s Asymmetric Resilient Cybersecurity initiative. Using game theoretic applications and terminology in their mathematical analysis of cyber-system security, the researchers proposed ideas for quantification of adversary payoff uncertainty—payoffs being penalties (negative values) and rewards (positive values) associated with the actions of a cyber-system defender and attacker. Their work presents new ideas for development of a probabilistic framework to reason about attacker payoff uncertainties and uncertainty quantification methods to address sources of uncertainties in the attacker payoffs. Moreover, it is a step toward improving models of an intelligent adversary and defender in response to or anticipation of a cyber-system attack. Chatterjee S, M Halappanavar, R Tipireddy, M Oster, and S Saha. 2015. “Quantifying Mixed Uncertainties in Cyber Attacker Payoffs.” In 2015 IEEE Symposium on Technologies for Homeland Security (HST ’15), pp. 1-6. April 14-16, 2015, Waltham, Massachusetts. DOI: 10.1109/THS.2015.7225287.